Something must be very wrong with things as they are if it is possible for the public to lose any portions of such a Park. Surely something can be done to prevent this ever-recurring danger of stealing, under one pretense or another, any portion of so valuable a fresh-air space in a great city like this. The ongoing debate over the financing plan for the new Brooklyn Bridge Park, which calls for the construction of luxury condos and a hotel on six sites within the park's footprint to pay for its upkeep, has divided many in the community. In my posting on the second public meeting on alternatives to housing in Brooklyn Bridge Park, I wondered what Frederick Law Olmsted, the father of American landscape architecture, would have thought of the suggestion of housing in Central Park or Prospect Park. I found the answer in an old article from the New York Times (see above). Apparently, in 1874, Olmsted objected to a proposed building in Central Park by stating: "Will the Park, by the plan proposed, be made more valuable as a substitute to the mass of the people for a visit to the country- as affording the greatest possible healthful change of scene, of air, of mental associations from those to which they are subject under the ordinary conditions of city life?" In 1912, shortly after Olmsted's death, park proponents had to fight to keep another building out of Central Park. 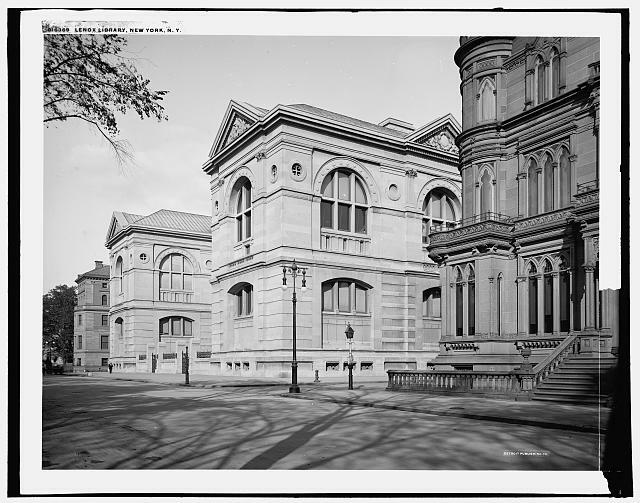 City officials had proposed to reconstruct the Lenox Library near the Arsenal. 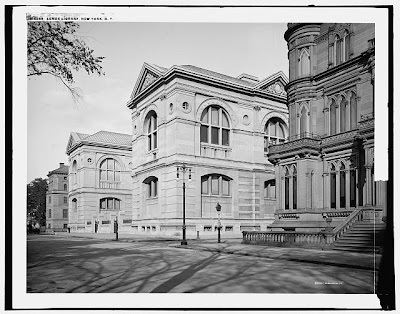 The library, founded by bibliophile James Lenox in 1871, was originally located on Fifth Avenue between 70th and 71st Streets. It contained not only Lenox's vast private collection of books and documents, but also the first Gutenberg Bible that came to the New World. In 1906, the ornate building was sold to steel magnate Henry Clay Frick for $2.5 million. Intending to build his own mansion on the spot, he offered to relocate the structure to Central Park. That suggestion, however, resulted in widespread public protest and broadened "into a general movement in favor of a strict Park policy against building encroachments of any kind." Both the American Institute of Landscape Architects and the Parks And Playground Association were vehemently opposed to the plan and quickly organized to dissuade the Art Commission of New York City, who voted on the matter. Artist W.B. Van Ingen, who had painted many scenes of Central Park, added his voice to the protest. He wrote: "The Park was created that the people of the city should have ready and inexpensive access to such scenes of nature as may be reached by the wealthy through their opportunities of travel. It was designed to provide means of escape from the sights of buildings, and screens of trees were placed with the avowed intention that such structures might as far as possible be shut from the sight." Thankfully, the proposal was ultimately defeated and Lenox's collection becoming part of the New York City Public Library on 5th Avenue at 42nd Street. A hundred years ago, as today, buildings in public parks were viewed as a dangerous precedent and against the interest of the public. For decades, New Yorkers have been able to successfully defend their green oases. Lets hope that Brooklyn Bridge Park will not be the exception that becomes the rule. Please-NO LUXURY CONDOS in the park for the rich! PERIOD! Why are the affordable housing groups silent? Do they even know? We desperately need housing for our teachers, fireman, and the artists too. They are now priced out and being forced out of all of the neighborhoods near the park. PLEASE TELL YOUR POLITICIANS, Marty Maskowitz and the Mayor who are looking for new locations for the working people to live. AFFORDABLE HOUSING NOW OR NEVER. Put catering halls and party spaces on all the roofs and they will be sold out and have waiting lists at these park locations.